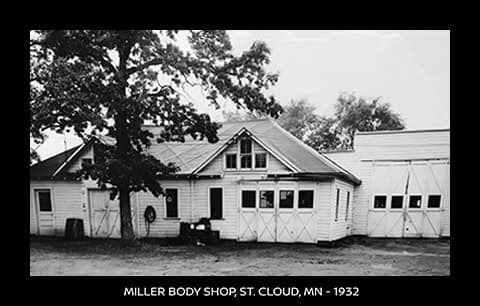 What is now a company of over 200 employees; Miller Auto began in 1932 as a small repair shop which was opened by John Miller, the father of current owner Tom Miller. In 1959, the business became a Pontiac dealer and shortly after, Tom began working for his father in the family dealership and sold his first car – a 1956 Chevrolet Bel Air. 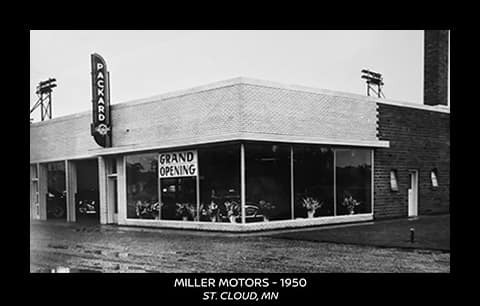 At that same time, the family dealership moved from its humble repair shop beginnings into the downtown St. 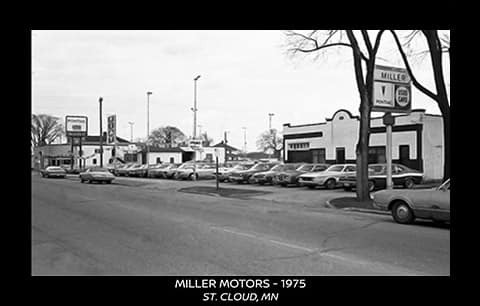 Cloud location where it stood for nearly 40 years and was commonly known as “The Little Profit Dealer.” Tom acquired a portion of the business from his father in 1974 and by 1985, Tom had acquired full ownership. 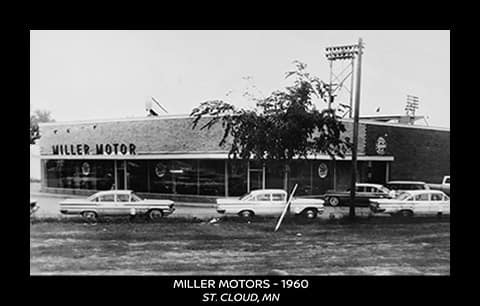 In the mid-1990’s, Miller Auto became Miller Auto and Marine with the addition of a marine line of products. With the business growing, it was also time to move into a new, more spacious building. In 1998, the Company moved from the downtown location to our current location, previously occupied by the Knox Lumber Company. The land from the old downtown dealership was generously donated by the Miller family to the City of St. Cloud and is now the home of Great River Regional Library. The Company continued to grow through the 2000’s and early 2010’s and in 2014, acquired the old Wal-Mart property and building adjacent to the current plaza. In addition to the main plaza and old Wal-Mart building, we have acquired or constructed many other buildings over time including our state-of-the-art body shop, reconditioning center, marine service shop, Buick-GMC sales building, and our two service drives. Miller Auto and Marine currently carries new models of GMC, Nissan, Buick, and Lincoln along with a huge selection of pre-owned makes and models, many of which are kept in our spacious, weather free indoor showroom. Our service drives and body shop are full of certified technicians ready to perform maintenance and repair work on nearly all makes and models. On the marine side, we carry new models of Bennington pontoons and Starcraft and Smokercraft boats adorned with Yamaha engines. We are proud to be recognized as the World’s Largest Bennington dealer! Our marine department also services nearly all makes and models of watercraft and motors. At Miller Auto and Marine, we strive for perfection in our attention and dedication to our customers and employees. Deeply rooted in our culture are the core values of Integrity, Respect, Empathy, Teamwork, and Excellence. No matter your need, all of our departments are stocked full of employees ready to provide you with the Miller 5 Star Experience!